There are a lot of apples (and pears) on trees in the Rattlesnake Valley this year. That’s both good and bad news. The bad news is that these fruits are a major attractant for wildlife like deer and bears, and once those animals get habituated to people and homes, they’ll get into more trouble that won’t end well for either the animals or the people. Fortunately, the Rattlesnake Valley grows delicious fruit. There are lots of great recipes for apple and pear products, and if you have a lot of them you can press cider. (The MUD Project is a good place to rent a press). If you want fruit but don’t have any fruit trees of your own, you can volunteer with the Great Bear Foundation–see contact information below. On the other hand, if you have more fruit than you can use yourself, please contact RCWG and we’ll put your apples and pears (and maybe plums) to use at our October 26th Fall Festival (official announcement coming soon! ), or (if we can’t feed them to people) we’ll donate them to Opportunity Resources where they’re used as animal feed. And please feel free to contact RCWG by email or phone Eric @ 406-240-1986 for more information or to donate fruit for use at the Fall Festival. Thanks! Assault on Buckthorn Island: planned for Tuesday, August 19th, 5:00 p.m. Volunteers from the Clark Fork Coalition and RCWG have spent several evenings pulling buckthorn seedlings and saplings along the western banks of Rattlesnake Creek adjacent to the PEAS Farm. 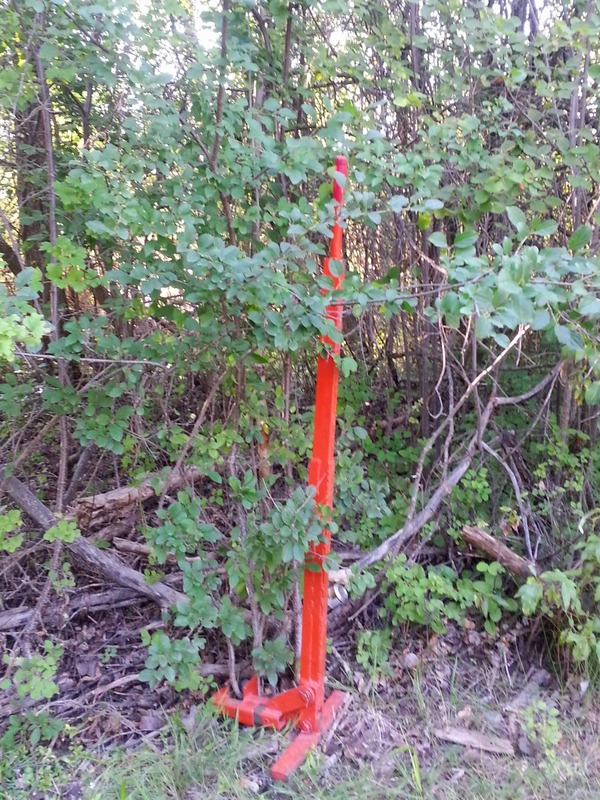 On our last outing in early August, CFC colunteer coordinator Bryce and I discovered what we hope is the original infestation of buckthorn along Rattlesnake Creek. 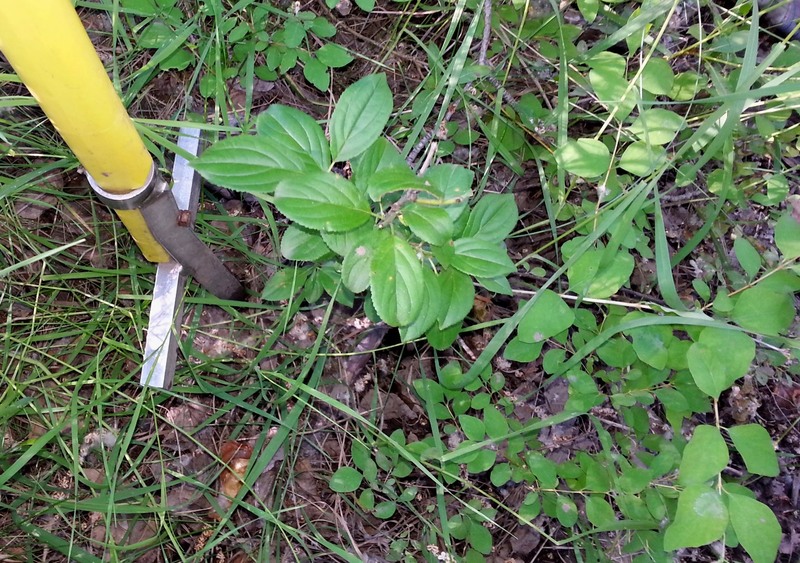 These aren’t just weeds–they’re trees. The largest stem is more than two inches in diameter. Even with a weed wrench, we won’t be pulling these plants out by the roots. But according to experts such as the Minnesota DNR (buckthorn is a more well-established and problematic invader in the Midwest than it is in Montana–so far!) we can control these plants by cutting them near the soil and covering the cut stem with black plastic, or by treating the cut stem with an appropriate herbicide (we will consult with weed specialist Morgan Valliant at the City before we embark on any poisoning–it sounds like just covering the stems may do the job). We need to act fast because these buckthorns are mature adults, on the verge of reproducing–i.e. they’ve got lots of berries that are starting to ripen, after which they will be eaten and dispersed by birds (not by mammals or humans, since they’re poisonous to our kind–the original Anglo Saxon name of this plant is “purging buckthorn” which matches its scientific name Rhamnus cathartica L.)(yup, that “L.” stands for Linnaeus–the big guy–this plant goes way back in northern Europe 🙂 ). So we’ll go back out there one last time (for this year, anyway) with our weed wrenches and also with clippers, loppers, pruning saws, garbage bags for the fruiting branches, and plenty of determination to eradicate buckthorn from one small island along the western edge of Rattlesnake Creek. You can help! Contact us by email and then show up at 5:00 p.m. Tuesday, August 19th, at the end of Mountain View Drive on the west side of the creek, off Duncan Drive south of the PEAS Farm. 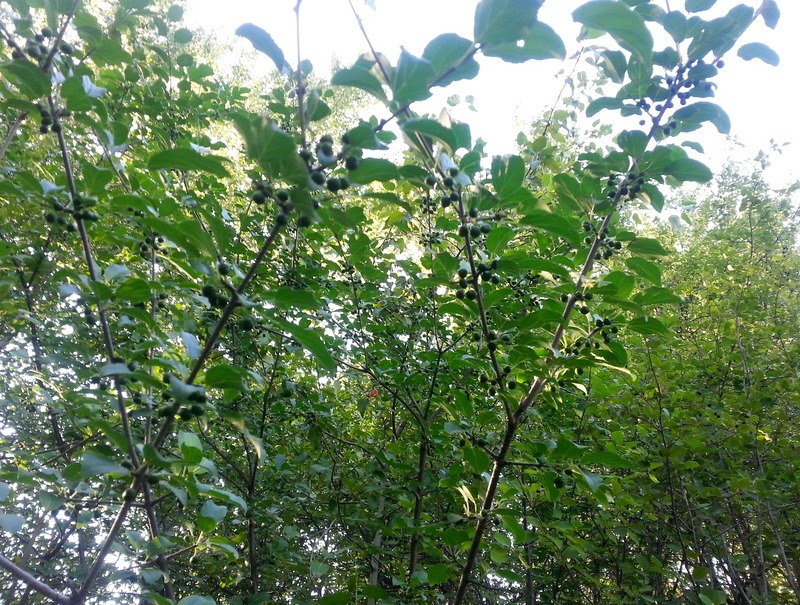 Buckthorn is an aggressive introduced plant that is choking out native vegetation along Rattlesnake Creek. 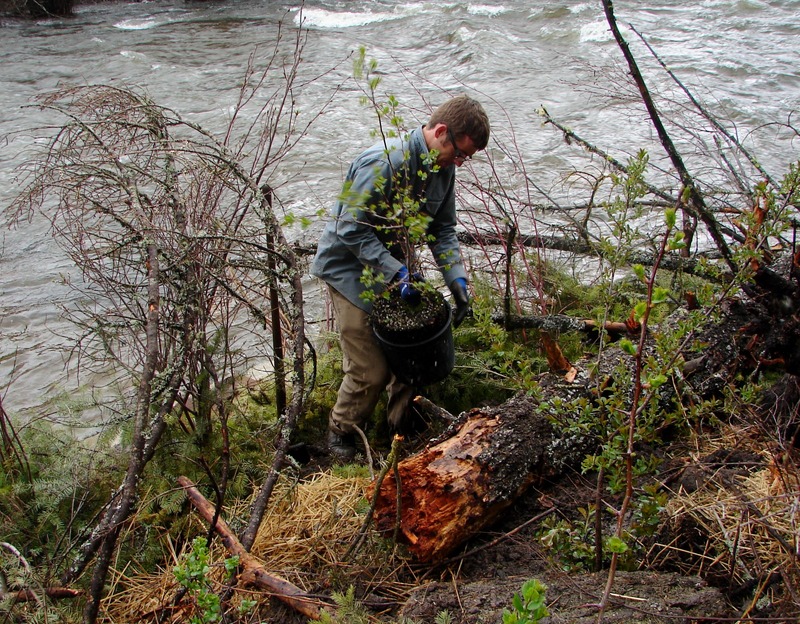 Will you help us pull this nasty invasive that’s causing havoc along one of Missoula’s most beloved backyard creeks? Bring gloves and sturdy shoes and meet us at Pineview Park on Tuesday, July 8th at 5:30 pm. Our local rivers are past their peak spring flows and the danger of major flooding is past, but the water in Rattlesnake Creek is still pretty high and fast. 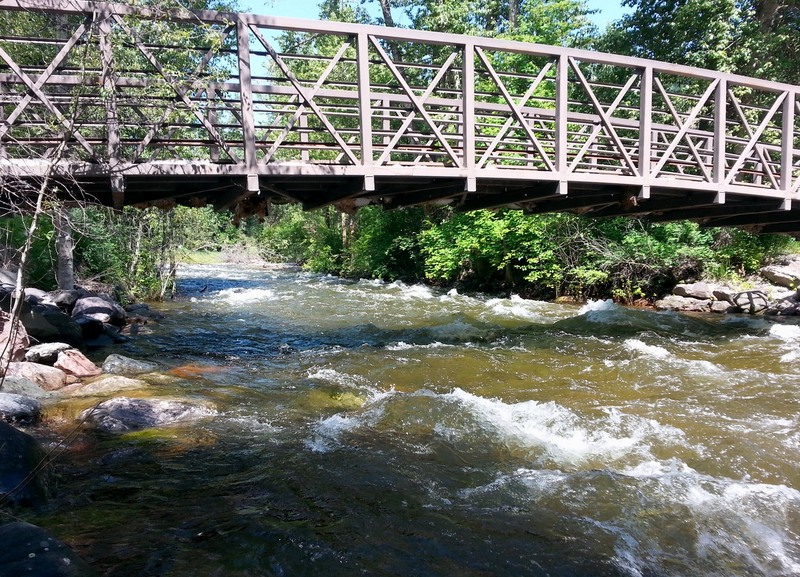 This week would be a good time to brush up on River Safety, and coincidentally you can do just that this Wednesday, June 25th, from noon-1 at Silver Park (specifically, the boat ramp next to Osprey Stadium) for the Clark Fork Coalition’s River Season Kickoff. Along with a river safety demo from licensed river guides, you’ll learn about 2014 rules for boating the Blackfoot River, hear the latest construction plan for Milltown State Park, and take a tour of Missoula’s newest riverside hangout at Silver Park. If you haven’t been up into the Rattlesnake Recreation Area for awhile, you’ll see some changes at the “horse bridge” about a half-mile in from the parking area! Last fall a couple dozen large boulders were deposited along the trail, and in early March of this year the Forest Service and Geum Environmental Consulting used an excavator to construct berms around the popular stream access area just downstream from the bridge. Logs and conifer slash were added to the boulders and topsoil to create a stable surface, with temporary fencing added for protection. Then this past weekend (Sunday May 4th) volunteers from the RCWG joined in to plant several dozen shrubs and pines. RCWG obtained a grant from the Western Native Trout Initiative to supplement Forest Service funds on this project. It still looks a little rough but as the plants grow in over the next few years it should develop into a natural-looking streamside, with protected access for people and horses to reach the stream without damaging the bank. Maintenance this summer will be important–the new plants must be watered and protected from trampling. RCWG plans to rely on volunteers to help with this effort, and if you’d like to be part of the team, even for just a day or two this summer, we’d love to hear from you. The Rattlesnake Creek Watershed Group is one of a number of local non-profit organizations that have joined Give Local Missoula. It’s part of a nation-wide program that takes place on May 6th. Donations of any amount from $10 up will be matched by local and national prize money. Check out the website and please consider donating on that day to help RCWG and other worthwhile groups. Saturday, April 19th, 4:00 p.m. at Missoula’s Carmike 12 Theaters (Reserve St. & Mullan Rd.) Theater details here. The first 50 or so ticketholders will win a free bear-related prize (including Defenders of Wildlife stuffed bears, Mountain Press books, REI daypack, and Counter Assault Bear Spray) (one prize per family please). Handouts and local experts will be on hand to discuss techniques and practices for people to live safely in bear country. Merry Christmas, Happy Holidays, and best wishes for the coming year! Panorama view across the Rattlesnake Valley toward Mount Jumbo, seen from the North Hills. Photo by Eric Edlund, Dec.22, 2013. It’s been another good year for the RCWG. This fall we received funding from the U.S. 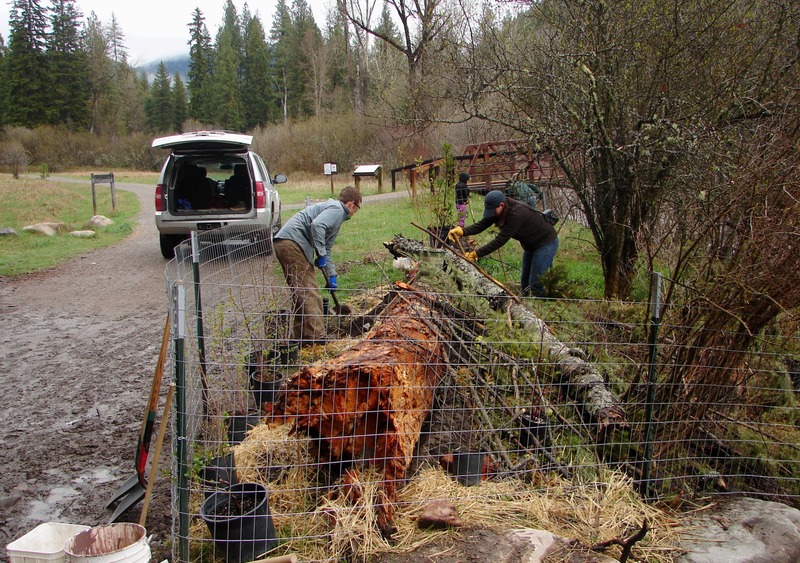 Fish & Wildlife Service via the Western Native Trout Initiative to work with the Lolo National Forest to improve streambank and riparian habitat in Rattlesnake Creek near the “horse bridge”. Some large boulders have already been delivered, and work should commence around early March 2014. Earlier in the year we also completed restoration work in Bugbee Park, and we hosted several successful events as part of the Bear Aware Apple Share project, including the inaugural Tour da Bear and the second annual Fall Festival at Ten Spoon Winery. In December we wrapped up the funded portion of the project (thanks to the City of Missoula’s Neighborhood Large Grant program), but we’re planning further events for 2014 and of course we’ll continue to work with partners like Great Bear Foundation and missoulabears.org to help keep the Rattlesnake Valley safe for humans and bears in the future. 2014 will bring some changes to the RCWG. Jill Alban will be stepping down from her position as President, and later this spring we’ll lose Greg Peters, our current Vice President. Starting in January, Dave Fortner and Eric Edlund will serve as co-Chairs of the Advisory Board. We’re looking for new Board members–if you’re interested please contact us and/or attend our mid-January board meeting (details will be posted on this web page). The work of the Rattlesnake Creek Watershed Group depends on volunteers and fundraising from the community; whether you’d like to volunteer, attend a meeting, make a tax-deductible donation, enlist our help with a watershed project, or just want more information, please contact us by email or phone. Thanks!